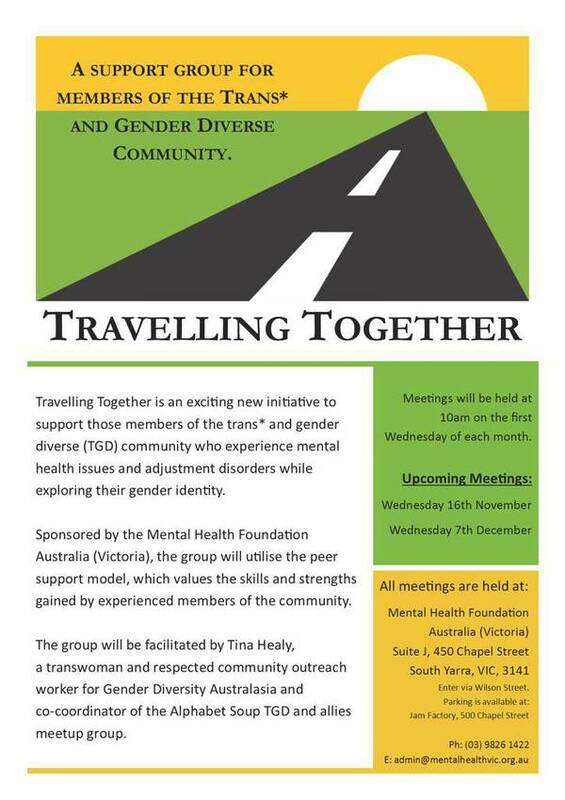 Travelling Together is an exciting new initiative to support those members of the trans and gender diverse (TGD) community who experience mental health issues and adjustment disorders while exploring their gender identity. Sponsored by the Mental Health Foundation Australia (Victoria), the group utilises the peer support model, which values the skills and strengths gained by experienced members of the community. The group will be facilitated by Tina Healy, a transwoman and respected community outreach worker for Gender Diversity Australasia and co-cordinator of the Alphabet Soup TGD and allies meetup group.